Describing himself as an intuitive painter, often working on multiple paintings at once in his pre WWI weatherboard house (an ex priests rectory) by the Broadwater Creek on the outskirts of Moree in north west NSW – Nicholas Osmond’s arrival as a painter in mid-life came in the wake of two severe injuries that left him unable to walk as he recuperated. Anchored in an instinctive sense of colour and guided by emotion, Nicholas creates loose semi abstract works based on current and past narratives in Australian history. Nicholas Osmond is relatively new to painting. With a degree in classical literature, a nursing qualification, work in probation and parole, the disability sector and the Green Corps and decades of experience as a country gardener, Nick took up painting just a few years ago when recuperating after a series of injuries left him temporarily unable to walk. He lives in a pre-WWI weatherboard house (an ex priest rectory) on the banks of the Broadwater Creek in Moree, North West NSW where he paints of an evening after his day is spent outdoors gardening or working at the nursery. He sometimes refers to himself as a gardener who paints. 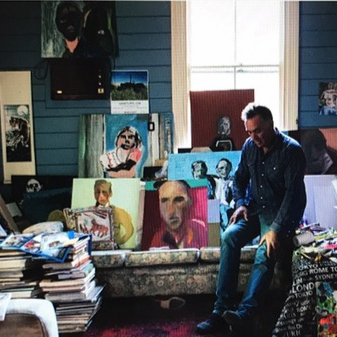 Anchored in an intuitive sense of colour and guided by emotion, he works in a semi abstract style, painting figurative images based on past and current Australian narratives, to achieve a unity of colour. There is a great energy in his brushwork. Nick works wet on wet, with whatever colours are there. There is a flatness to the picture plane as he plays between depth and space, using the paints to create clashes in regard to the colours. “I try to reduce detail and set emotion, as a means to create subtlety and greater space for colour to say everything. I love to paint PEOPLE! Either as portraits or in a loose narrative style. My painting style is semi abstract, moving some times to realism. Often influenced by Sidney Nolan and Adam Cullen, I’m often also inspired by Van Gogh, Gauguin, and Goya. Painting in a loose naive style works well given the in-distinctive way I paint. I require a very firm image, visualisation or photographic record to commence an artwork, yet believe most of the final image comes from the following artistic process and development.